Note: The ability to utilize this functionality comes at an additional cost. Please contact your CSM to learn more. Using this flow will allow you to gather valuable information that your Advocates are supplying in AdvocateHub and sync this information directly to their Salesforce Contact record. Examples of this flow include collecting personal advocate information that your employees may use to surprise and delight, storing AdvocateHub response data for further targeting and personalization, or even improving your SFDC data cleanliness. You will enter the Influitive Response ID from the question in your challenge that you would like to map to Salesforce and in the same row, enter the corresponding Salesforce Field Name. A webhook will be triggered when an Advocate answers one of the questions you have entered an Influitive Response ID for, it will read the Google Sheet and see which Salesforce field you want the response sent to and will complete that action. Note: This functionality will only map to the Contact object in Salesforce at this time. Note: If you are asking for a date to be returned it must be in the format YYYY-MM-DD otherwise Salesforce will reject it and the rest of the questions in that stage so it is import to follow this syntax. Note: We recommend making the character length of the Salesforce field the max length (255 characters). If an answer goes over that amount the flow will fail for that user. Next, we need to retrieve the Influitive Response ID. 3. Right-click anywhere on the page and click Inspect if using Google Chrome, Inspect Element in Firefox, the F12 key if using MS Edge or Internet Explorer. This will open the developer tools in the browser. 6. 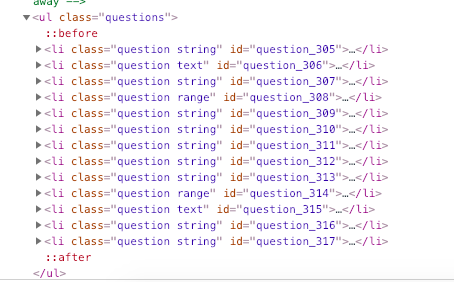 You can see in the first-row id="question_305". The number is what is important here, 305 is the Influitive Response ID for the first question in this challenge, 306 for the second question in the challenge etc. The responses are always going to be unique and will be different for other challenges. 9. You are done! Next time an Advocate completes this stage, their answer to the question in Influitive will be mapped automatically to the Salesforce specified! Here is a video which visually walks through the steps above if you had trouble following along!